WOODLAND — The 96th annual Woodland Planters Days drew to a close this weekend on Sunday, after four full days of a community-wide celebration that area residents look forward to every year. Planters Days began on Thursday afternoon when the carnival opened in Horseshoe Lake Park. The first day of the festival, which was planned as a day for younger participants, also hosted a children’s chalk art show and a children’s parade. The Miss Woodland coronation took place on Thursday evening, as well, when the 2018 Princesses Hannah Landrigan, Sammi Ripp, and Lani Stepper were all hoping for the chance to wear the crown. 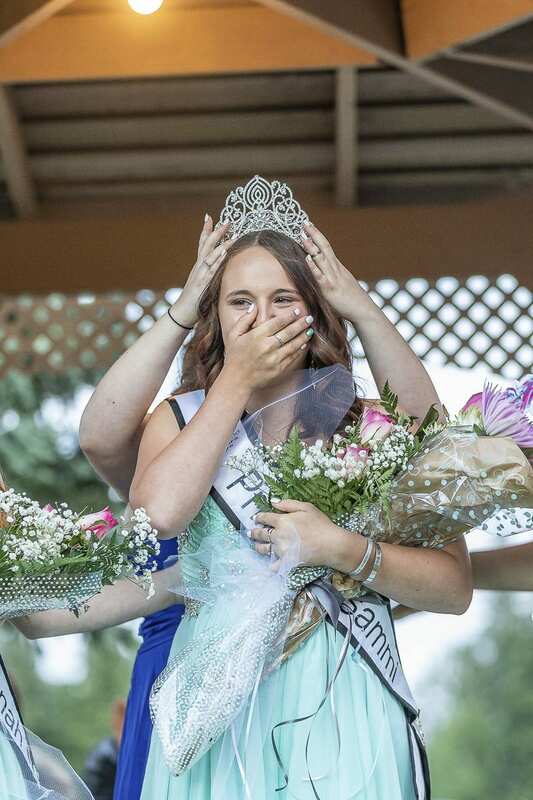 When the 2018 Miss Woodland was announced, Princess Sammi Ripp became the one to receive it. The final event of the first night of Planters Days was a 20-minute fireworks show at Horseshoe Lake Park. Friday functioned as a bit of a slower day for the festival as the community prepared itself for the string of big events the following day. A book sale, bingo competition, and Veterans of Foreign Wars open house at Post 1927 all took place on Friday, while the carnival continued to operate throughout the day. Michael Davis, manager of Davis Amusement Cascadia, is a fifth-generation traveling carnival entertainer whose family has been working in the industry for nearly 80 years. Davis’ company provides the rides, games, and carnival foods each year at Planters Days, and he claims that coming to Woodland each year is one of his favorite events. Festivities kicked off on Saturday morning with not one, but two breakfasts hosted by the VFW Post 1927 and Moose Lodge. Parade floats began to assemble at the start of the route at 8 a.m., parade judging began at 9 a.m., and the parade itself began down Davidson Avenue at 11 a.m.. Historic fire trucks, retired military vehicles, local logging company equipment, marching bands, and, of course, the newly crowned Miss Woodland could all be seen making their way through Downtown Woodland as thousands of onlookers cheered and children scrambled to pick up thrown candy from the ground. Following the parade, a line formed around the Horseshoe Lake Park concession pavilion as festival regulars and newcomers alike prepared for the Woodland firemen to serve up some barbecue beef sandwiches. Entire quarters of beef had been placed in the famous barbecue pit the night before, where the meat cooked and smoked for over 12 hours. A community favorite event at Planters Days, the sandwiches did not last long; within two hours of serving up the first sandwich, the beef was entirely used up. The annual Frog Jump, one of Woodland’s longest standing community traditions, entered its 51st year in the 2018 Planters Days. 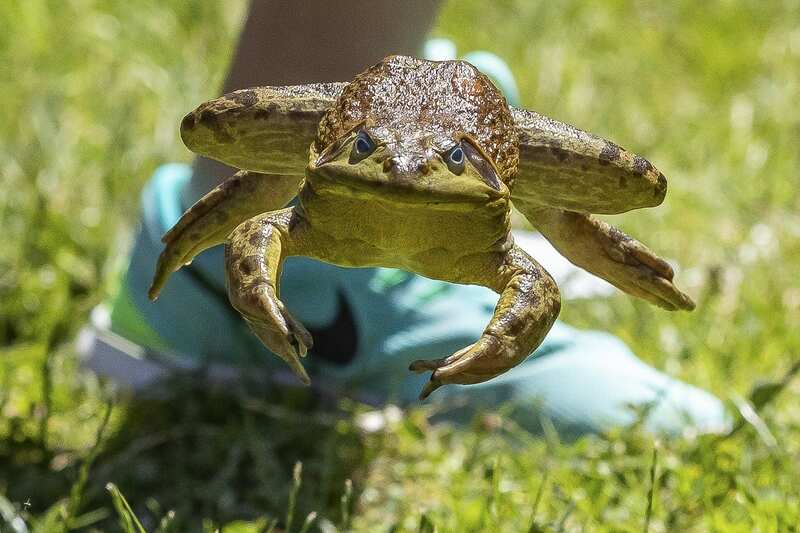 Organized by the Hansen family since 1968, the rules of the frog jump are simple; area children are invited to catch a wild frog and bring it to Planters Days to compete in a jumping match against dozens of other frogs. Each frog is given three jumps, and the frog with the longest jump is declared the winner. Prizes for largest, smallest, prettiest, and ugliest frog are also awarded. For the Hansen family, the Frog Jump is a family event, and everybody pitches in to help make it a success. The founder’s youngest son, Walter Hansen Jr., claims that the frog jump has become a crowd favorite event not just for his family, but for families all over the area. “It’s become a generational thing,” Walter Hansen Jr. explains, noting that there are families involved in the frog jump who have been participating since the event’s conception and are now into the third and fourth generations. Further down the park, a display of 18 historic military vehicles offers families a look into the history of the United States Armed Forces. The Military Vehicles Collectors Club of Oregon has been involved in Planters Days thanks to Dennis Ripp, one of the club’s members who is also an area resident and employee of the city of Woodland. Ripp, who for the past several years has ferried curious festival-goers on his amphibious “duck” boat through Horseshoe Lake, also helps organize military vehicle transportation for the Woodland Princess Court at other community festivals in the surrounding area. “We also are involved with the Planters Days princesses. Our club takes them through the Long Beach Loyalty Day Parade; we always have military vehicles provided to haul them through the parade,” Ripp explains. 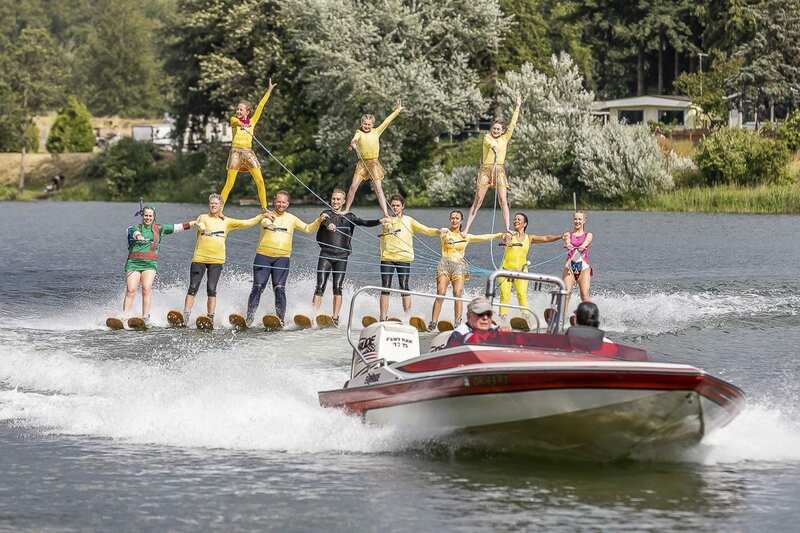 On Saturday afternoon, those attending the Planters Days festival had the chance to witness a water ski show provided by the Portland Water Spectacular Show Ski Team. Water skiing is a family affair for many members of the team, including the treasurer, Jim Boland, and his granddaughter, Hillary Pettina. Boland claims that Horseshoe Lake has been one of the ski team’s favorite locations to perform, having been involved with Planters Days since Boland joined in the 1980s. Pettina, who is a third generation member of the water ski team, says that she joined in order to spend quality time with her mother and grandfather while doing something she enjoys. Despite some winds and choppy waters, viewers witnessed the ski team perform various stunts on the water, and skiers dressed as video game characters Link and Zelda even made a surprise appearance at the performance. The team that claimed ultimate victory was The Princesses and the Frogs, made up of Woodland residents Alex Wakefield and Jack Wear, and the Woodland Princess Court, Princess Hannah Landrigan, Princess Lani Stepper, and Miss Woodland Sammi Ripp. The Woodland Planters Days continued through Sunday with a car show, talent competition, and an encore ski show performance.